A cracked tooth is a tooth that has become broken. A tooth can crack in several different ways ; the signs and symptoms as well as the treatment options depend on where the crack is and how deep and large it is. As a general rule, it is important to get advice as soon as possible to help the treatment be more effective. If not treated in time, cracked teeth can lead to dental pulp infections that could need root canal treatment or bone infections that will require the removal of the tooth. In severe cases, the tooth can actually split in two. If this happens, your dentist will not be able to save the tooth and it will need to be taken out. Why do teeth crack ? Many things can cause teeth to crack. Craze lines are tiny cracks that affect only the outer enamel. They are common in all adult teeth and cause no pain. Craze lines need treatment only if aesthetic demands are extremely high. A chipped tooth is when a small piece of enamel breaks off from the corner of an anterior tooth (incisor, canine). Normally, chipped teeth do not cause any pain. Most chipped teeth can be repaired by bonding a tooth-colored filling. It is important to see your dentist as soon as possible after the injury to treat your chipped tooth and keep it from worsening. A cusp is an elevation on the biting surface of posterior teeth (molars and premolars). Many times, a cusp can break around a filling. A fractured cusp rarely damages the pulp but sometimes it can cause a sharp pain when biting down on something. In some circumstances (especially when the crack is deep), patients may feel an increased sensitivity when drinking cold fluids. Most often, the dentist will place a dental crown or a dental onlay to protect the biting surface of the tooth. 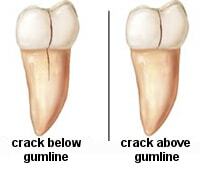 A cracked tooth has a crack that extends from the chewing surface of the tooth vertically towards the root. In this circumstance, the tooth is not yet separated into pieces, though the crack may gradually spread. Sometimes, the crack goes below the gum line and into the root, which leads to a poorer prognosis. Early diagnosis is important in order to save the tooth as the crack can progress towards the dental pulp and further into the root. The tooth may hurt sometimes when you bite or chew. If the crack has penetrated into the pulp (or it is very close), you may feel a mild or intense pain that can last a brief time or a long time (this varies from patient to patient). Normally, there is an increase in sensitivity to cold, hot or sweet foods. Many people with cracked teeth have symptoms for months. In many cases, it is very difficult to diagnose them, as the pain is not predictable. If the crack has extended into the pulp, a root canal therapy is required to save the tooth. After the root canal procedure is completed, it is advisable to place a crown over the tooth as it provides maximum protection. However, if the crack extends below the gum line, it is no longer treatable, and the tooth cannot be saved and will need to be extracted. That is why early treatment is important, as a cracked tooth that is not treated will progressively worsen, eventually resulting in the loss of the tooth. A split tooth is often the result of an untreated cracked tooth. The tooth splits into two parts that can be separated. A split tooth may develop an infection in the gum around the fractured tooth. Normally, split teeth hurt when biting or chewing, although this is not a general rule. A split tooth cannot be saved intact. The position and extent of the crack, however, will determine whether any portion of the tooth can be saved. In some cases, endodontic treatment may be performed to save a portion of the tooth. Vertical root fractures are cracks that begin in the root and go up towards the biting surface. They often show minimal signs and symptoms and may therefore go unnoticed for some time. Vertical root fractures can lead to infections in the surrounding bone. Most often, teeth with vertical root fractures cannot be saved and the tooth will need to be extracted. However, endodontic surgery is sometimes appropriate if a portion of the tooth can be saved by removal of the fractured root. !! !Unlike a broken bone, the fracture in a cracked tooth will not heal. In spite of treatment, some cracks may continue to progress and separate, resulting in loss of the tooth. However, treatment is very important as it will relieve pain and reduce the likelihood that the crack will worsen. What can I do to prevent my teeth from cracking ? It is impossible to completely prevent cracked teeth. However, there are some steps to make your teeth less susceptible to cracks. If you grind your teeth at night (a condition called bruxism) wear a specific mouthguard to protect your teeth. Talk with your dentist about getting such a device. Retainers after braces: Why is it important?